A Health Care Reform Vote is expected in the House of Representatives will hold one of the most potentially explosive and important votes on Sunday. The Senate passed a version of this health care bill previously. Their version passed on Christmas Eve, 2009. If it passes on Sunday, the next step will be a signature by President Obama and a sweeping change of the Health Care system as we know it. The number of votes required rests at 216. Democrats are very excited and confident that they will easily surpass this number. The debate will start at 1pm Eastern Standard. In actuality the voting will be a series of votes to determine a winner. It will be a three round boxing match between Republicans and Democrats with a few intermediates. The first vote will help lawmakers understand the “rule” understanding the parameters to debate the bill. The second vote will help “change” or “correct” problems with the Senate’s version of the bill. Then those “fixes” must then be approved by the Senate. The final vote will be to approve the Senate approved bill. This will be an exciting yet potentially explosive vote and you can expect some surprised to be in-store. A huge question that will be asked is how can the Republican stop the bill. The answer seems to lie with the Senate’s “Byrd Rule” in which any senator can find a piece of the new bill and does not address budgeting issues. And several Republicans believe that they have found substantial areas of question. An important point of interest is that if one word of the reconciliation bill is changed in the Senate. That bill will subsequently returned to the House and be approved again. This could change the three expected votes to a few more. On Saturday President Obama made his final pitch for a sweeping change and his all importan health care reform. He told Democrats “Let’s get this done.” Obama words also try to show the importance of health care for a system that is currently believed to be failing. It is currently believed that 33 Democrats are planning to vote against the bill and a total or 38 Democrats who vote against it would kill the bill. Therefore a fierce battle continued Saturday night into early Sunday morning. Sunday will be a monumental day and many Democrats are hoping that things fall on their side of the argument. While Republicans are arguing that if the bill is passed it is just short of a governmental takeover that won’t stop the exorbitant medical costs. The fight has begun — this should be interesting. Is it the right time for a medical change? Can we aford it – can we afford not too! 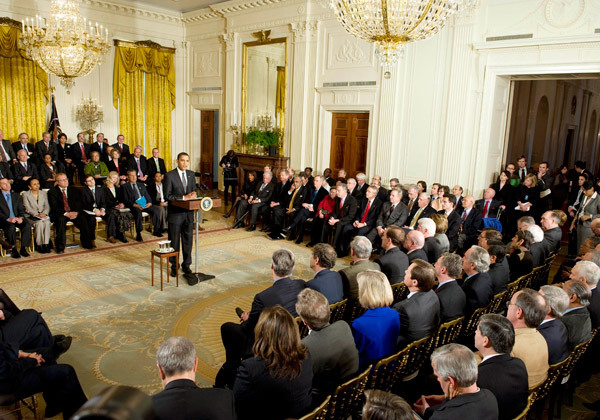 Obama’s updated health care reform – where are we going?? I recently read that almost 65% of the nation is less than excited for the passing of this bill. There are so many things involved that don’t include health care. Often government decisions have a price tag that many don’t really understand. I am not happy!!! Interesting is that when Obama does something for the greater good there is grief about his intention. He is really trying to make life better. If you haven’t noticed, health care is out of control. We need something to change. I applause this bill and all it will change. Wait five years and you will be grateful for this change. Obama won’t be around in 5 years but we will be cleaning up the mess.